In a recent interview with Exclaim, White Lung frontwoman Mish Way says their new record Sorry is a more melodic venture for the Vancouver weird-punk foursome, and that there are distinct possibilities of fan alienation. Having wowed audiences across the country and beyond with their 2010 full length debut, It’s The Evil, there has certainly been some anticipation building for the next chapter. That said, if there are any self-professed White Lung fans out there that can’t get behind this latest output, they may need their hearing and/or attitudes checked. The aforementioned melody doesn’t seem at all out of place within the chaos around it, and is easily heard in the almost Bif Naked harmonies on “Bag,” and Kenny McCorkell’s shimmering, creepy breakdown on “St. Dad.” Aside from these slight ventures outside their normal repertoire, it is business as usual for White Lung. Way yells and wails over McCorkell’s frantically strummed chords and the rock solid rhythm section of Grady Mackintosh on bass and Anne-Marie Vassilou on drums. Perhaps contributing to the overall speed and intensity of the record was the triple-session process by which it was recorded. But even if the songs were rushed in studio, they don’t sound rushed; rather, they sound focused. There is not an ounce of fat on this record. And if there is any alienation caused by the melodic inclusions, I’m sure Sorry’s producer and former d.b.s. member Jesse Gander would agree: expectations are for the old. 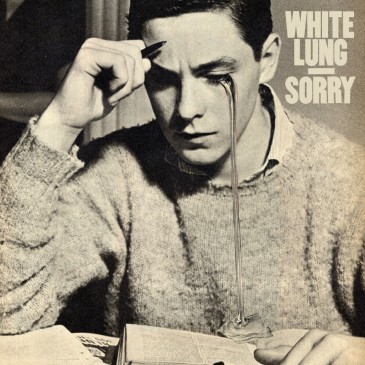 White Lung is back. Get into it Vancouver!